On March, 2018, in Technology, Uncategorized. My brain hurts. 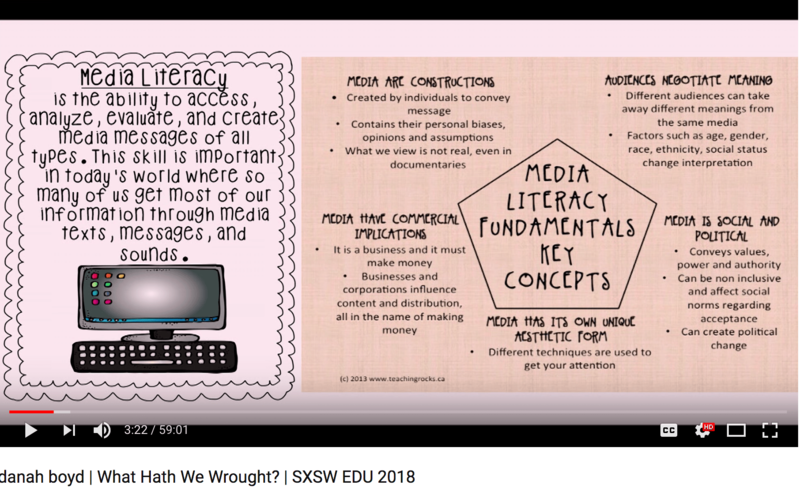 Dana Boyd gave the keynote speech (1 hour) at SXSWedu (an annual media conference with an educational add-on). I first caught wind of the controversy through Stephen Downes’ blog. I read Dana Boyd’s original post, and a response by Benjamin Doxtdator. Before reading Dana Boyd’s follow-up on Medium, I decided to watch the video, the whole hour. This is where I am now. She has raised issues that I had not considered and am still working on integrating into my framework. A challenge. The reason this is so important is that I teach English in Tokyo and use a lot of tech doing so. Moreso, this year, I am concentrating on providing a wide range of online opportunities in most of my classes this year. I have added a series of activities (self-evaluation, introspection on motivation, communication, and learning, along with goal setting and planning) to give students both more freedom and more autonomy, and make sure they have the tools to handle it. Then I let them loose (well, with a semi-curated set of content) to explore and work with the results of those first few activities. I am not so sure I can do that, now. I really need to rethink how I approach my use of online materials. I have moved away from teaching English directly as a subject, and promote self-learning of English by using it as a thinking tool. I can get away with this because most of my students are solid intermediate level and above. But the concerns she raises mean I have to look at how a non-native speaker should treat the media landscape (ie the web). In some ways, my students and the culture in Japan can (and have) teach me about how to hold two conflicting ideas at the same time and not go crazy. The problem is that this ability is not usually applied to content and interaction on the web. Discounting everything is the road to nihilism. Blind belief is the road to becoming a patsy. But foisting your opinion, even with scientific evidence, is also not an answer. Recognizing that individuals and institutions such as shock vloggers and Cambridge Analytica play the media regularly to their own ends, and more important work to devalue the media and all other forms of authority is becoming an indispensable skill. This is Howard Rheingold’s crap detection on steroids and taken to another orbit. One of the keys is being able to recognize toxic information and walking away. Ignoring things is something I have been taught is completely wrong. But now, with manufactured content designed to create a visceral gut reaction and a response, realizing the Buddhist idea of impermanence may help. Lots more thinking to do first, though. And learn how to discuss with people who disagree with me while avoid being gaslighted. One offshoot of how to target media literacy which has been on my mind as of late is how confident the educated always seem to be that — while media bubbles, propaganda and misinformation are admittedly all problems — they are never problems which apply to *them* personally. That is, that somehow we are not affected by media manipulation; it’s those unthinking “others” who are guilty of sharing fake news. In fact, just yesterday, one of our friends asked on Facebook, “So who’s thinking of deleting their account?” and answer after answer on her thread was some variation on “Oh I’m not worried, because I can spot media manipulation”. I’ve read somewhere* that it’s the intelligentsia who are actually in the greatest danger of being manipulated precisely *because* they are so used to trusting their own expertise. The answer, I think, is in teaching students how to strike a sustainable balance between educated confidence and critical skepticism, especially as they become more and more media literate. In any case, excellent questions and links, thank you!